During the winter, HDG partners with several churches in Montgomery County to provide space for the Winter Haven Emergency Shelter. The shelter rotates from one church location to the next every 1 - 3 weeks. This typically involves many trips or rental of a U-Haul truck or trailer. After the shelter period ends, HDG has to rent storage space to store the shelter supplies until the next season. A private donor agreed to gift HDG with a SUV to pull the trailer from one location to the next. Our goal is to raise $5000 to purchase a trailer to store and haul shelter supplies. Money saved from rentals go back into serving our clients. House of Divine Guidance Winter Haven Emergency Shelter serves single women and mothers with children. Forty-four percent (44%) of our residents are young children under the age of 12. Mothers contacting Winter Haven Emergency Shelter live in fear that their children will be taken from them because they have no place to sleep at night. There is no laws against homeless adults sleeping outside, but there are for homeless children. Each year, House of Divine Guidance receives call from schools seeking placement for minor children both with their mother, as well as teens displaced from home. Many people often limit their thoughts of the homeless to those seen on street corners and sleeping on benches. But, there is an entire population of homeless that the public does not see that are sleeping on floors, couch sifting from one place to another , sleeping on buses, in restaurants, or in hospital emergency rooms. These are the residents Winter Haven generally serves. The invisible homeless! The ones your children go to school with everyday. Often, the women/mothers are no longer able to reside at these locations, they are recently evicted, and/or they are fleeing abusive or toxic relationships seeking safety for themselves and/or their children. There is not enough shelters to house the growing number of homeless women in need. Winter Haven Emergency Shelter feels the gap by providing refuge for county and noncounty residents. For women and children, Winter Haven is a safe, nurturing, and supportive Christian environment providing guidance to women as they plan their next transition. Winter Haven Emergency Shelter opens for the 6th year December 16, 2018. It will remain open through March 15, 2019. Winter Haven is an overnight shelter ONLY. Referrals are required. Go to DHHS, MC Crisis Center, a school counselor or a social service agency for a referrals. Call 240-888-6775 or click here for referral information. This past winter HDG served over 90 women and children in 10 weeks. This was 21 more than last winter. 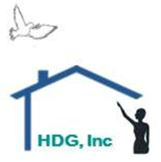 Dec 3rd: HDG launches The Lighthouse Initiative Program, a transitional housing program that Empowers, Educates, and Employs young mothers 18-25 years of age with children 0-5 years of age. Dec 2nd: HDG open The Lighthouse with ribbon cutting by George Levethal, MC County Council President, Congressman's Chris VanHolden's aid, and HHS administrator. "I'm blessed to have you in my life. I'm proud of you helping me." "You are a answer to my prayers."